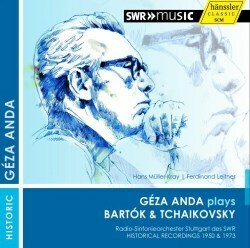 Géza Anda gave these concerto performances with the Stuttgart Radio Symphony Orchestra, almost a quarter of a century apart. The disc thus documents a musician who had developed and matured over a period of a generation, playing two works strongly associated with him. But one concerto was as yet not solidly part of his repertoire – it had yet to be stabilised interpretatively. It is thus fascinating to hear his performance of his compatriot Bartók’s Second Concerto, here given with conductor Hans Müller-Kray in November 1950. Those familiar with the soloist’s forays in this concerto – Praga has, for instance, recently reissued Anda’s broadcast performance with Fricsay and the RIAS orchestra in September 1953 on Praga PRD/DSD 350 108 - will know the general outline of his performances. These were to an extent moulded with Fricsay’s collaboration. Despite his familiarity with the work, this Stuttgart broadcast with the SWR sounds structurally tentative and collaboratively edgy. The proportions of the work are far broader than was later the case, especially the slow movement, which sounds out of scale and too disjunctive at this tempo. There is also some scruffy ensemble, which is perhaps not wholly reprehensible as the orchestra would have been largely unfamiliar with Bartók’s idiom and had probably never before played the concerto. What also rules it out is the sonics. The sound is very watery and dull – it applies to the piano as well as orchestra – and great chunks of detail go missing. This 1950 visit was Anda’s first to the SWR orchestra but he was to return several more times. In 1973 he and Ferdinand Leitner performed the Tchaikovsky First – the same year the BBC taped him in Bartók’s Second [BBCL 4247-2]. As ever in this work – witness, say, another of his German broadcasts in his earlier collaboration with Solti and the Cologne Radio Symphony in 1958 [ICA Classics ICAC5092] - he marries poetic finesse and triumphant virtuosity. There are moments of spellbinding lyricism, as well as dramatic flourishes, none of which are marred by thumping. He was ever a natural poet of the keyboard, but one who could roar with the best of them. Fortunately the recorded sound here is excellent, and whilst some orchestral detail is smudged and there are some passing ensemble incidents this is a galvanizing reading through and through. For Anda admirers here is an opportunity to hear his Bartók concerto in embryo, and to take pleasure in his Tchaikovsky.